The old way of setting lines. Cut or find three wood blocks at the same thickness. 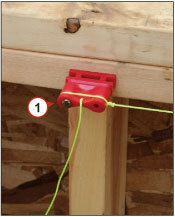 Fasten one stand-off block using three nails at each end of the stud wall. Stretch a line between these blocks. 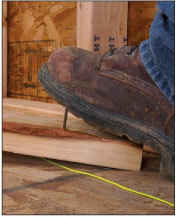 Then use a gauge block to check the wall alignment every 6 to 8 feet. 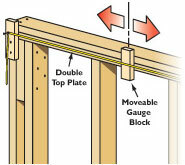 If the wall is straight the line should barely touch the gauge block. After straightening, pry off the blocks and discard being careful of protruding nails. 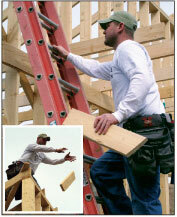 No more tossing blocks or carrying blocks up the ladder. No more excessive use of nails. No more injuries on scrap blocks left behind. 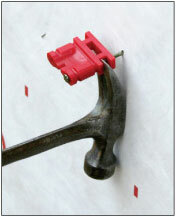 Now take a look at the a much better way to straighten the same wall! 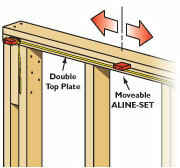 Fasten two ALINE-SETs using one nail each at both ends of the stud wall. Stretch a line between the ALINE-SETs. 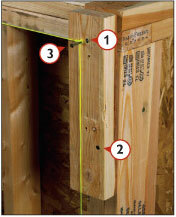 Then use a third ALINE-SET to check the wall alignment every 6 to 8 feet. If the wall is straight it will gauge to the same offset. After straightening, easily remove using the claw of your hammer and place ALINE-SETs and nails back in your pouch for next time. Easily accessible and convenient. One nail for improved efficiency. 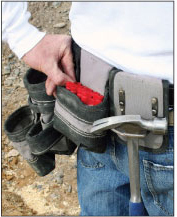 Removes quickly and easily for added safety.